This brand new 4GB CF hard disk drive is ideal for a desktop Amiga 1200, 600 or 4000 / 4000T (options below). It is silent, low power and fast alternative to a conventional hard disk drive. It is ready-to-go: we supply it partitioned and fully formatted. 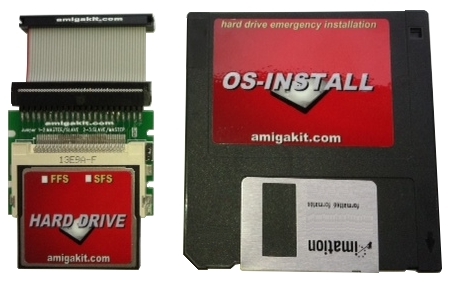 The drive is preloaded with our exclusive AmigaKit.com OS Install program which allows you to quickly install Workbench with the minimum of hassle. Directory Opus 4.16 GPL is preloaded onto the hard disk for easy file management. The Amiga's premier game installer, WHDLOAD (unregistered version) is also pre-installed with kind permission from the author. As an additional service, we can pre-load a licenced version of the full Personal Paint 7.3c paint/graphics software package to the hard drive at time of purchase. If you want the new PPaint on the hard disk, simply select the PPaint option: this can be found under the Extra Apps On Hard Drive configuration option below. As an additional service, we can copy a licenced version of the full EasyNet Pro networking/internet software package to the hard drive at time of purchase. If you want EasyNet Pro on the hard disk, simply select the EasyNet Pro option: this can be found under the Extra Apps On Hard Drive configuration option below. Amiga 1200 / 600 version supplied with CF media, 44-way IDE cable and adapter board, ready-to-go. Amiga 4000 / 4000T version supplied with CF media, 40-way IDE cable and adapter board, ready-to-go. You can also specify the IDE cable length that is supplied with the hard drive below. Picture for illustration purposes only- actual make/model may vary. This drive is formatted with the normal FastFileSystem. 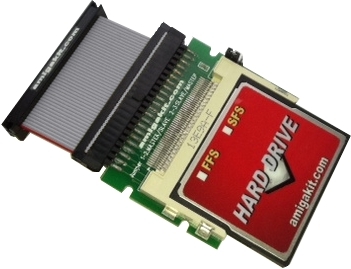 If you have an Amiga 1200 or 4000, you can request us to have the drive pre-formatted for Smart File System or Professional File System - we do not charge any extra for this service. Compatible with Kickstart 2.05 (37.300 or 37.350), Kickstart 3.0, Kickstart 3.1, Kickstart 3.5 or Kickstart 3.9. Actual product may vary slightly from picture shown. Pre-loaded apps are available as optional extra - configurable at time of purchase below. The optional Personal Paint software is supplied for Classic OS 3 only by A-EON Technology Ltd and licenced exclusively for use on this hard drive only. Some pre-loaded files are supplied under licence from Amiga Technology Ltd.